Please join us as we gather at member firm HILTON GARDEN INN where the Garden Grill & Bar has been reserved exclusively for this event. 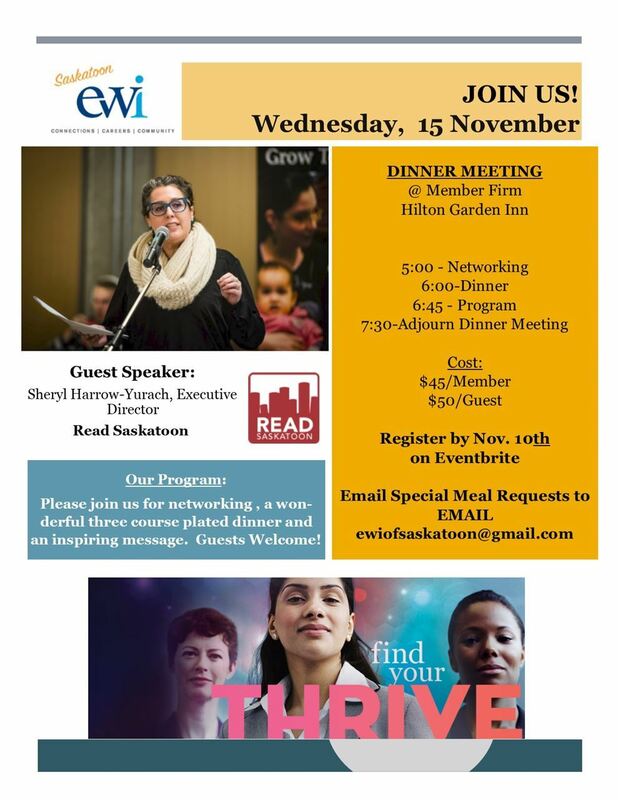 We are excited to have Sheryl Harrow-Yurach, Executive Director with READ Saskatoon as our featured guest speaker. To coincide with having Sheryl with us for this evening; we are kicking off one of our partnerships. We have committed to collecting 275 children/young adult books over the next 11 months to give to READ SASKATOON to use as needed. We ask that you consider bringing a book to the meeting to support literacy in our community. Cost: $50.00 Guests & $45.00 Members. *Please note that cancellations after the November 11th will be subject to full cancellation fee of costs.